The Devil‘s Slide is one of the more unusual natural form-ations along the wall of Weber Canyon, in Utah. There, two limestone layers, tilted to near vertical, rise 40 feet above the canyon wall with 25 feet separating them. Looking like a large playground slide fit only for the Devil, this site is a tilted remnant of sediments deposited in a sea that occupied Utah‘s distant geologic past. About 170 to 180 million years ago, a shallow sea originating from the north spread south and east over areas of what are now Montana, Wyoming, and Utah. This sea extend as far east as the present-day Colorado River and south into northern Arizona. Over millions of years, massive amounts of sediment accumulated and eventually formed layers of limestone and sandstone. In northern Utah, these rocks are know as the Twin Creeks Formation and are approximately 2700 feet thick. About 75 million years ago, folding and faulting during a mountain-building episode tilted the Twin Creek rock layers to a near-vertical position. 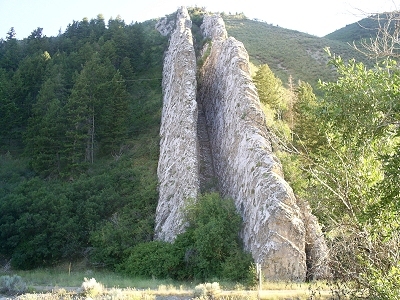 Subsequent erosion of softer material has exposed the near vertical limestone layers and created Devil‘s Slide.